My Review: I’ll be the first to admit that I don’t drink the most blended whites. There’s no particular reason, and sure, some of the wines that I drink have a touch of this or that, but they are, by and large, single varietals. So I’ll admit that getting to try what was not only a blended white, but a blend featuring some grapes that I’m not terribly familiar with, was great. 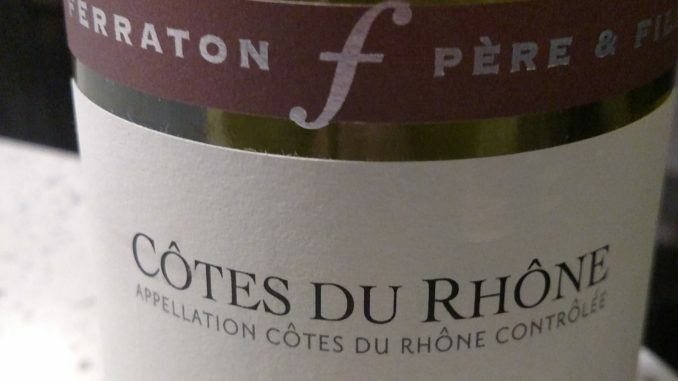 So, what did I think of the 2016 Ferraton Pere & Fils Cotes du Rhone Samorens Blanc? On the nose I picked up aromas of flowers, while in the mouth the fine was bright and fresh, bringing in flavors of white flowers and a bit of citrus that was crisp without being tart. My wife and I paired the wine with some spicy tuna rolls that we made at home and it did a nice job of going with the sushi, showing some versatility. I don’t think there’s any chance of this wine becoming a regular in our house – it was tasty enough, and I always appreciate versatile wines, but it also didn’t knock my socks off. That being said, at $14 it’s a good value, and certainly something I’d consider if I came across it on the shelves and was looking to mix it up.